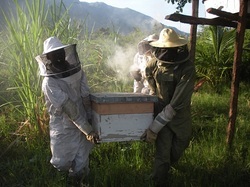 Only by hands-on, practical working with bees in their natural environment does one feel that they can truly succeed in keeping and caring for African bees. We invite and encourage seminar participants to be part of our harvests. There can be no better follow-up to theory training in our seminars than studying the inside of a colony of bees during the harvest. Different types of hives, brood chamber and the laying pattern of the queen, queen excluder and honey comb can all be looked at in detail. Those who have participated in this aspect of our training say it has been the most fundamental factor in their desire to keep African bees.